DID YOU NOT KNOW THAT I MUST BE IN MY FATHER’S HOUSE? This Sunday is the Feast of the Holy Family, Jesus, Mary and Joseph. In this important solemnity, the Church seeks to show us what makes a family holy – how a family can live a holy life in the midst of daily struggles. Our two examples today are not perfect, idyllic families but fully human with all their ups and downs. Sustaining them, though, is a deep faith and trust in God. Our first reading, taken from the First Book of Samuel (1 SM 1:20-22, 24-28) is the story of Hannah, a woman who prefigures Mary and Elizabeth. Barren, she prayed for a son, promising she would dedicate him to God. In today’s reading, she bore a son Samuel. When he was weaned, she and her husband Elkanah brought him to the temple and gave him to the high priest Eli and dedicated him to God. Samuel was destined for greatness and was the prophet who anointed the shepherd David to be King of Israel. Once Samuel was weaned, Hannah brought him up with her, along with a three-year-old bull, an ephah of flour, and a skin of wine, and presented him at the temple of the LORD in Shiloh. After the boy’s father had sacrificed the young bull, Hannah, his mother, approached Eli and said: “Pardon, my lord! As you live, my lord, I am the woman who stood near you here, praying to the LORD. I prayed for this child, and the LORD granted my request. Now I, in turn, give him to the LORD; as long as he lives, he shall be dedicated to the LORD.” Hannah left Samuel there. In our Gospel reading (Luke 2:41-52) is the story we know well as The Finding in the Temple. It is a story of the tension of an adolescent Jesus, full of zeal to be about his father's business, and yet very much under the control and loving protection of his parents. In the end, he returned with them to Nazareth and was obedient to his parents, while his mother pondered all these events in her heart. Each year Jesus’ parents went to Jerusalem for the feast of Passover, and when he was twelve years old, they went up according to festival custom. After they had completed its days, as they were returning, the boy Jesus remained behind in Jerusalem, but his parents did not know it. Thinking that he was in the caravan, they journeyed for a day and looked for him among their relatives and acquaintances, but not finding him, they returned to Jerusalem to look for him. After three days they found him in the temple, sitting in the midst of the teachers, listening to them and asking them questions, and all who heard him were astounded at his understanding and his answers. 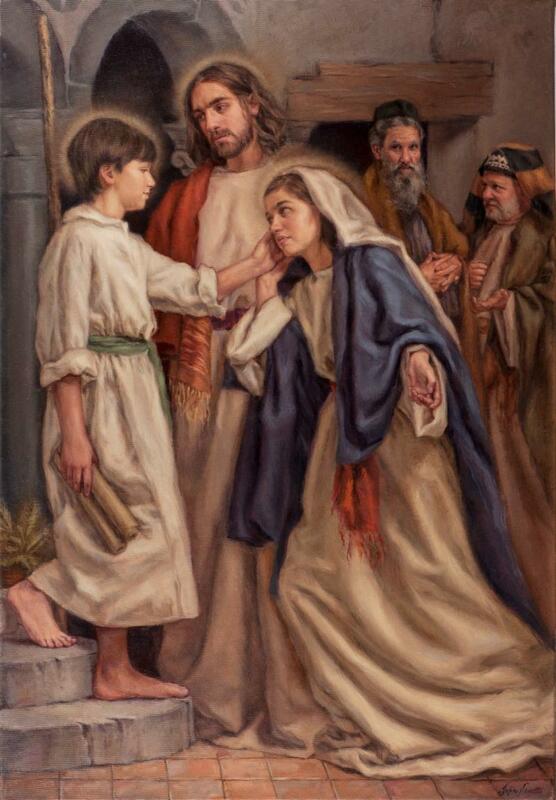 When his parents saw him, they were astonished, and his mother said to him, “Son, why have you done this to us? Your father and I have been looking for you with great anxiety.” And he said to them, “Why were you looking for me? Did you not know that I must be in my Father’s house?” But they did not understand what he said to them. He went down with them and came to Nazareth, and was obedient to them; and his mother kept all these things in her heart. And Jesus advanced in wisdom and age and favor before God and man. In our Epistle reading (1 John 3:1-2, 21-24), St. John gives us a clue to our destiny, “We do know that when it is revealed we shall be like him.” John’s letter calls us to holiness, to love one another, to have confidence, to believe in the name of Jesus. Beloved: See what love the Father has bestowed on us that we may be called the children of God. And so we are. The reason the world does not know us is that it did not know him. Beloved, we are God’s children now; what we shall be has not yet been revealed. We do know that when it is revealed we shall be like him, for we shall see him as he is. Beloved, if our hearts do not condemn us, we have confidence in God and receive from him whatever we ask, because we keep his commandments and do what pleases him. And his commandment is this: we should believe in the name of his Son, Jesus Christ, and love one another just as he commanded us. Those who keep his commandments remain in him, and he in them, and the way we know that he remains in us is from the Spirit he gave us. Our family is God’s gift through which we journey back home to the Father; and our parents, brothers, sisters, and siblings in Christ are all on the same journey with us. May we pray for guidance and follow the example set for us by the holy family of Jesus, Mary and Joseph. "See what love the Father has bestowed on us."